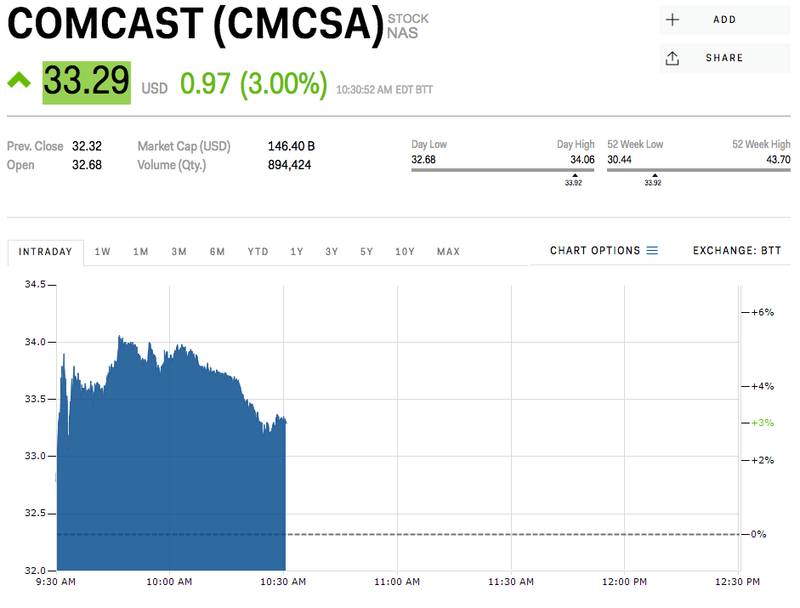 Comcast is surging after it proposed an all-cash deal to buy 21st Century Fox assets. The offer's price tag tops the recent deal proposed by Disney. Jefferies analyst John Janedis says the deal is financially accretive and that Fox won't be able to resist. Watch Comcast trade in real time here. Comcast shares are up 3% Thursday after the company proposed an all-cash offer for 21st Century Fox assets. Comcast offered 21st Century Fox $65 billion in cash for its production assets and movie franchises (excluding Fox Business and Fox News), topping Disney's $52 billion stock offer for those same assets. The television giant made the proposal a day after the Department of Justice approved the pending AT&T and Time Warner merger, which sets a regulatory tone that seems to be merger friendly for the industry. Jefferies analyst John Janedis thinks Fox won't be able to resist the offer. "Comcast addressed key regulatory concerns (break fee, divestitures) which led Fox to initially choose Disney, making it difficult for Fox's Board to continue to move ahead with the Disney offer in its current form," he wrote in a note out to clients. He added that a deal would be "immediately accretive to earnings-per-share and free cash flow." Jandeis has a $41 price target on Comcast shares, 23% above current levels. And Wall Street is largely bullish on Comcast as well, with 74% of analysts rating it a "buy" and none rating it a "sell." Comcast is still down 18.85% this year. Kate Spade was completely detached from her namesake brand at the time of her death, but nostalgic shoppers have flocked to its stores. Here's what the brand's future could be. 6Kate Spade was completely detached from her namesake brand at the time of her death, but nostalgic shoppers have flocked to its stores. Here's what the brand's future could be.